23.03.2017 / 0 comments / Categoria: ... And they were happily ever after! Verona and Brendan were engaged for 14 months before they tied the knot on the beautiful church of Sao Lourenco! Celebrations took place in Vilamoura with a lovely view to the golf and almost 100 people flew from different continets to witness their special day! We always wnated a destination wedding and the Algarve wss perfect for us. We were both very fortunate that both sets of parents were as excited at the prospect of going abroad as we were. Choosing the Algarve, and especially Vilamoura, was an easy decision as it ticked so many boxes for us - short flight from Ireland (under 3 hours) with choice of good-value daily flights from all major airports, short transfer time from the airport (under 30 minutes so our guests weren't spending the whole day travelling from Ireland), large selection of accommodation options from budget to 5* and self-catering to hotels, friendly and well developed tourist industry with range of nightlife and restaurant options and near-guaranteed sunny and warm weather! Our experience with the wedding planning and AE was wonderful! We never imagined that when the wedding was all done and dusted that we would have made a friend for life. Dália surpassed all of our expectations, always going above and beyond for us. 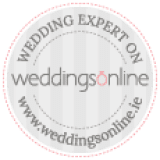 She made the planning a very easy and stress-free process and it was so reassuring to know that we had someone so organised and familiar with exactly how we wanted things done in charge of everything on our wedding day. We always enjoyed our meetings with Dália and the rest of the Algarve Events team (especially Taelor and Irina), it was always so relaxed and more like visiting friends! Our wedding day was incredible. Seeing all of the different elements we had discussed in and out for nearly a year come together and look so great was amazing. Our guests were blown away! There are way too many things that we loved so we can't choose our favourite! The only thing we had to think about was enjoying ourselves with all our guests and taking everything in as we were confident that Dália and Irina had everything in hand. We can't say that there were any funny/unique episodes during our day (not that we can remember anyway!) but we can guarantee that our guests felt that the whole day was unique for them. So many of them had never been to a wedding abroad and were blown away by our day. We had invited them all to travel great distances to celebrate our day with us so this was probably the best compliment that we could have gotten. We have no tips or advice for you AE, just keep doing what you're doing! We recommend you to anyone we hear of who are thinking of having a destination wedding (especially since we'd love to attend one as guests next time! ).